UNISTra members are performing at Ulsan Hyein School on June 22, 2016. "Music, not a talent to be developed, but a gift to be shared." Music is not a talent to be developed, but a gift to be shared. The UNIST Symphony Orchestra (UNISTra) has been sharing the joy of orchestral music for a variety of audiences. This professional 20-member orchestra offered their musical talents for local events for the third time this year. In March 2016, they performed for children at Ulsan Foster Care and in March 2016, they performed music for the disabled at the community Daycare Center for the Handicapped. 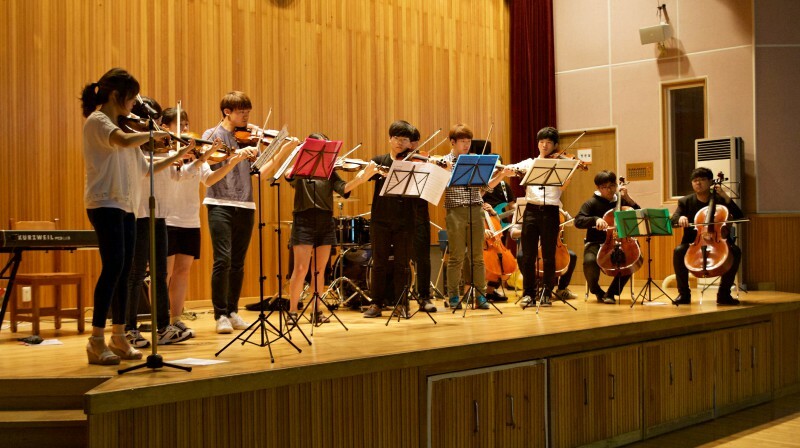 On Wednesday, June 22, 2016, they also volunteered their time at Ulsan Hyein School, a local special needs school to share the gift of music with those who truly need them. 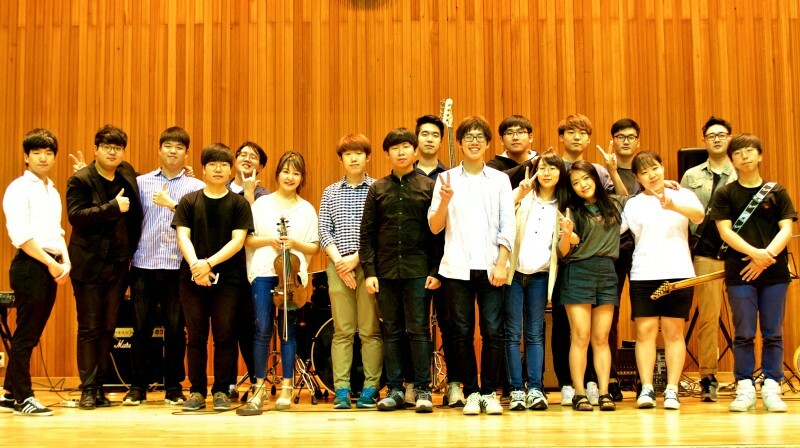 The members of UNISTra are posing for a group photo, after performing at Ulsan Hyein School on June 22, 2016. The UNISTra, under the music direction of Professor Jong Eun Lee of the Division of General Studies, is the full UNIST student symphony orchestra. Founded in May 2013, the orchestra has successfully performed nearly 14 large symphonic works. Orchestra members rehearse weekly and perform at important school events, such as the annual convocation and matericulation ceremonies. “This event provides great opportunities for students with disabilities to benefit from making and enjoying music,” Principal SooKwang Kim of Hyein School said. The event featured Antonio Vivaldi’ s “ Summer” from his famed “Four Seasons”, latin-flavored “Scent of a Woman” and “Bésame Mucho”. They were followed by “We are the Champions” by the British rock band Queen and “Smooth Criminal” by Michael Jackson, which are quite familiar to the general public.